We allocated more than $1 million in funding to 28 different research initiatives focused on cutting-edge research areas, with an emphasis on machine learning and artificial intelligence, expanding the cybersecurity talent pool, exploring new regulatory and governance structures to support cybersecurity, and protecting vulnerable online populations. 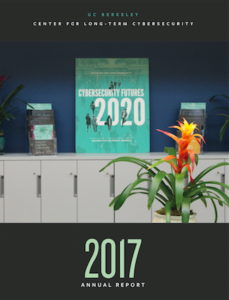 We published a series of white papers focused on diverse topics, including a proposal for a “Cyber Workforce Incubator,” the first-of-its-kind analysis of cybersecurity risks in the Olympic Games, and a set of scenarios about the future of cybersecurity in Asia. We helped coordinate the launch of “cybersecurity@berkeley,” UC Berkeley’s new Master Degree in Information and Cybersecurity (MICS), which will welcome its first cohort of students in June 2018. We published (and/or helped our grantees publish) op-eds in high-profile media outlets, including the Washington Post, CNN, USA Today, New York Times, Slate, and The Hill. We also published academic work in a variety of academic journals. We conducted fall- and spring-semester sessions of “Info 290: Future of Cybersecurity Policy Reading Group,” a one-credit reading group focused on cybersecurity policy problems. We hosted and sponsored an array of public events, including “Women In Tech: A Symposium On Innovation & Entrepreneurship,” which highlighted the experience of women in the tech industry,” and we convened a panel with the Center for Strategic and International Studies (CSIS) Cyber Policy Task Force focused on recommendations for the Trump administration. CLTC moved into our new permanent home on the UC Berkeley campus, allowing our staff and campus collaborators to work together in a shared space. We added three new researchers and two staff members, significantly growing our ability to invest in long-term projects and respond to short-term opportunities.